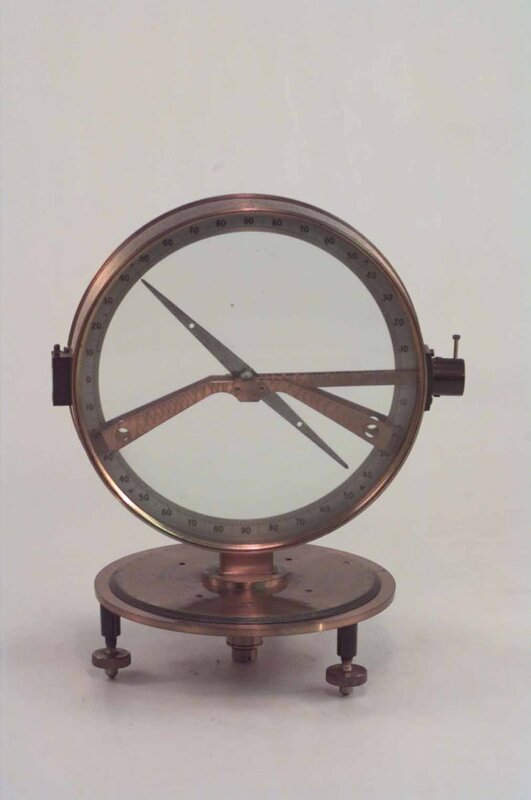 The magnetic dip needle consists of a brass cylinder with glass faces, 18 cm in diameter. A magnetised steel needle is mounted free to rotate about a horizontal axis through its centre of gravity. The needle will thus settle with its magnetic axis in the magnetic meridian and inclined to the horizontal at the angle of dip. The inclination is then read off the scale on the face marked with graduations 90o (vertical) through to 0o (horizontal). The other face is hinged and may be opened to reset the needle. There is a screw mounted on the side of the cylinder which raises or lowers an arm which catches and supports the needle and holds it in a fixed position for storage and transport. The cylinder is also able to rotate about a vertical axis through its circular base (diameter 15cm) which is also marked with graduations 0o to 90o in each quadrant. There are two holes on either side of the faces, positioned so that a square is formed. These may have been used for a spring arm or, more likely, for attaching a bubble level (though this does not easily explain the holes' positions). The stand has levelling screws on the supports. A small level was probably enclosed with the dip circle in its wooden case. This instrument is likely to have been of a 'sturdy' design, designed for field work. Compass and dip needles were used to find magnetite in Sweden in the Middle Ages, making the magnetic method the oldest of all applied geophysical techniques. This method of magnetic prospecting for ores was used extensively for iron mining up until the early decades of the twentieth century. However, the dip circle is not a sensitive enough instrument for most ore prospecting purposes and has been replaced with ground-based versions of magnetometers used in aeromagnetic surveys.